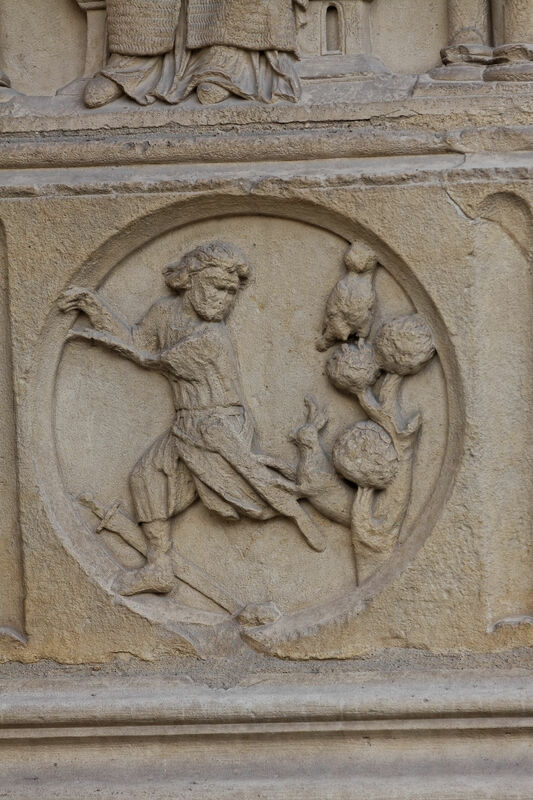 Knight pursued by rabbit, Cathedral of Notre-Dame, Paris. From time to time, we Indexers like to lift the veil, so to speak, on the cataloguing procedures and upgrades that we have undertaken online. One of our current priorities is filling out our Subject Authority records. These records are where researchers can find further information about a given iconographic subject, including the preferred term used by the Index for that subject and a brief description of the iconography, its main attributes, and its relevant cultural details. We know that visitors to the database may use alternate names, spellings, or related terms for a particular subject during a search query, and we’re determined to help you find them. As we Indexers like to joke, one scholar’s Maiestas Domini is another scholar’s Christ in Majesty! (rim shot) It is for this reason that we supply a field for “See-From” terms, a list of alternate names and phrases that will redirect you to the preferred Index iconographic term. Below is a sampling of our newest subject authority terms offered as an overview of our work methods, as well as a sense of where our field is heading with regard to iconography. Note: Aural method of riding in medieval Britain that consisted of banging two empty halves of coconuts together to mimic the sound of horse hooves. Nota bene: the coconut is not indigenous to the region and likely arrived due to the migratory practices of the African Swallow. Note: Surly Gallic individuals speaking with outrageous accents and serving Guy de Loimbard, possessor of “a” Holy Grail. Experts in deploying taunts at their enemies. Note: Favored weaponry of French Persons, comprising cows, geese, and other assorted farm animals to be hurled over castle walls. Note: Darkly-clad knights wearing helmets bearing cow horns, keepers of the sacred words “Ni,” “Peng,” and “Neee-Wom.” Those who hear them seldom live to tell the tale. Lovers of ornamental garden elements that are nice and not too expensive. Note: A deceptively cuddly rabbit who is a foul, cruel, and bad-tempered thing. It guards the entrance to the Cave of Caerbannog, home to the Legendary Black Beast of Arrrghhh. Note: One of the sacred relics created to “blow thine enemies into tiny bits.” Instructions for its use found in the Book of Armaments 2:9–21. * Note from the Editors: Given our reputation as a family-friendly blog, we have decided to redact this particular authority record. To that end, we have dusted off the Index’s trusty early twentieth-century subject heading “Scene, Obscaena.” As you readers are well aware, Latin makes everything sound more modest. The cataloguer responsible has been sacked.